Handcrafted Decoupage Jewellery Box with Mirror and Drawer, "France in Mexico"
In 1863, Napoleon intervened in Mexico and the defeat of the French troops in Puebla is the reason behind the 5 de Mayo celebrations. Yet the French influence lives on, and Avenida Reforma in Mexico City was modeled after the Champs-Élysées in Paris. 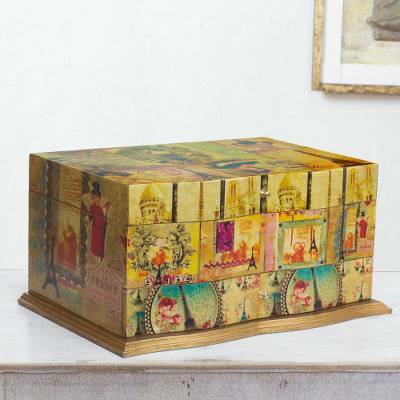 Handcrafted by Ana Maria Gonzalez, this decoupage jewelry box depicts scenes from France. The lid opens to reveal a large compartment, a pop-up tray and a convenient mirror. Beneath is a drawer. You can find decoupage jewelry box 'France in Mexico' by Ana Maria Gonzalez in jewelry boxes categories such as Decoupage Boxes and Paper Boxes. Enjoy exploring these sections for other Novica treasures.